Insuring a home today in Florida is becoming an increasing hard objective especially when it comes to older homes. Broward and Dade county adopted (FBC) Florida Building Code standards in 1994 while the rest of the counties followed suit in 2002. Most older homes built in Florida were built by (SBC) Standard building code and do not meet the standards of most insurance companies. A 4 point inspection qualifies older homes for homeowners insurance. Today we are going to discuss “Cloth Wiring” and how most inspectors misclassify this common problem especially in South Florida. So the question is Cloth Wiring insurable for Homeowners Insurance? 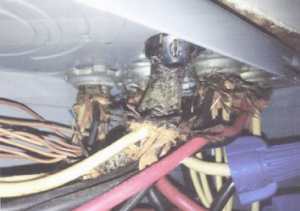 Cloth Wiring is considered a fire hazard for most insurance companies due to the the wiring overheating the cloth and starting a fire. The cloth wiring that most electricians consider dangerous is where the cloth is the only outside barrier to the metal conductor. 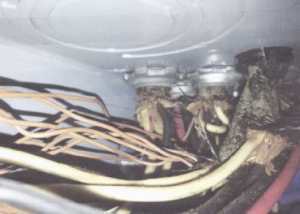 Cloth wiring considered extremely dangerous and replaced immediately. Most cloth wiring found in houses may not be dangerous. They usually have Romex wrapped around the wire and it would be covered by cloth sheathing. Below is an example of what is found in most 4 point inspections. If you have a 4 point inspection and it comes back with cloth wiring. You will need an electrician to inspect the wiring and determine if it is necessary to replace. Most electricians will not see the need to replace the wiring as long as the wiring is covered in romex. So to answer the question about is cloth wiring insurance for home-owners, the answer is yes by most accounts. Most insurance companies still will not accept a letter from the electrician deeming the wiring safe, their is still a limited market that would be able to write the insurance with great coverage. Always make sure that you call your agent to discuss the requirements and price quotes before proceeding. If you have any further questions about Cloth wiring insurance please call Florida Statewide Insurance, Inc. at 954-734-7429 for cloth wiring questions or any other insurance you may be interested in.